The adhesive industry was very much dominated by large adhesive manufacturers and sealant manufacturers with very little flexibility in what they could provide to their customers. It was evident that the bigger companies would not provide the personalised support needed to push the boundaries of what could be achieved with the use of adhesives. All of the products that Forgeway have developed and produced are in response to customer and industry feedback; including our renowned Formoa range. We work with our customers to solve industry problems, because of this, there is a story behind each product and its development pathway. There are few facilities or governing bodies that teach courses in adhesives and bonding. Universities and colleges tend not to teach the practical and specific skills involved in adhesives and bonding. We often have requests from customers asking for a more practical guide or training into the technical information around bonding and adhesives. There have been some excellent books written that cover adhesives and bonding that go into great detail as to the science behind adhesives and bonding, but these are aimed more at academics than people working in the manufacturing industries. We have undertaken the creation of the book The Fundamentals of Adhesives to provide a visual and practical resource for people wanting to know more about the uses of adhesives and how it affects the process of design in manufacturing. The Fundaments of Adhesives has not been written by academics, it has been written by Forgeway’s in-house R&D team, with first hand knowledge and experience working with customers to solve problems in the field. It has not been produced as a guide on what we can do for our customers, nor does it detail all the products we can provide for our customers. It has been designed to provide a comprehensive and practical guide for engineers. Our aim was to create something you could liken to “The Haynes Manual” of adhesives, “The Dummies Guide” to adhesives or an engineer’s best friend; packed with useful information and informative diagrams to clearly explain the theories and science around adhesives and bonding. 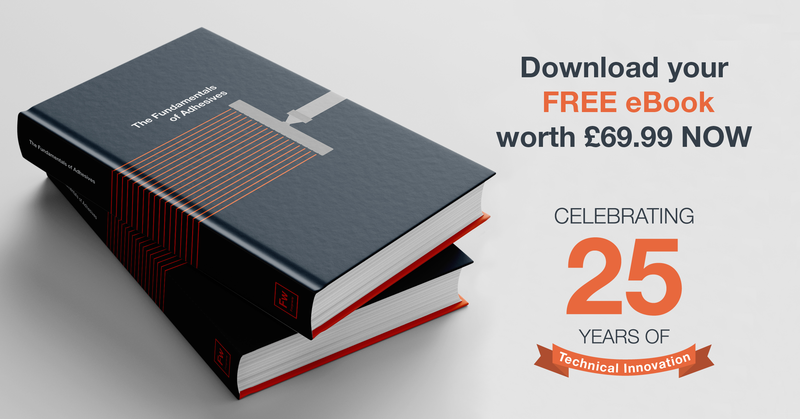 The content and insight within the pages of The Fundamentals of Adhesives is a compilation of 25 years of knowledge; developing and manufacturing adhesives for industries including transportation and solid surface. Forgeway’s adhesive knowledge is extensive, from colour matched adhesives for worktop ranges, to formulating and producing adhesives for aero engine fan track liners that can withstand bird ingestion testing. Forgeway have collaborated with leading manufacturers in jet engines, solid surfaces, flooring for transportation and more.